I FEARED it was going to be one of those days, sunshine promises rendered worthless by stubborn legions of low cloud. 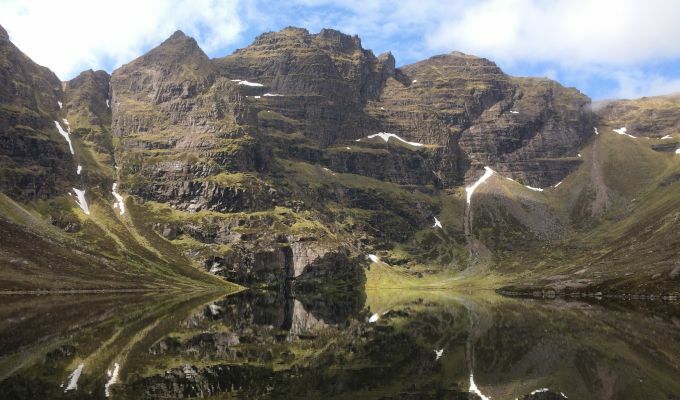 I had already sacrificed the chance to join friends on a traverse of An Teallach, instead choosing to stay lower to finally catch that classic view of the mountain from the little loch which sits beneath its plunging faces. The cloud-free forecast was excellent. The early gloom was due to disperse throughout the morning, leaving the peaks of the north-west Highlands clear. Except, there was no sign of any movement as I made my way in from Corrie Hallie. Some days you go out expecting the best and are left disappointed, other times you head out expecting nothing and being pleasantly surprised. This could go either way. 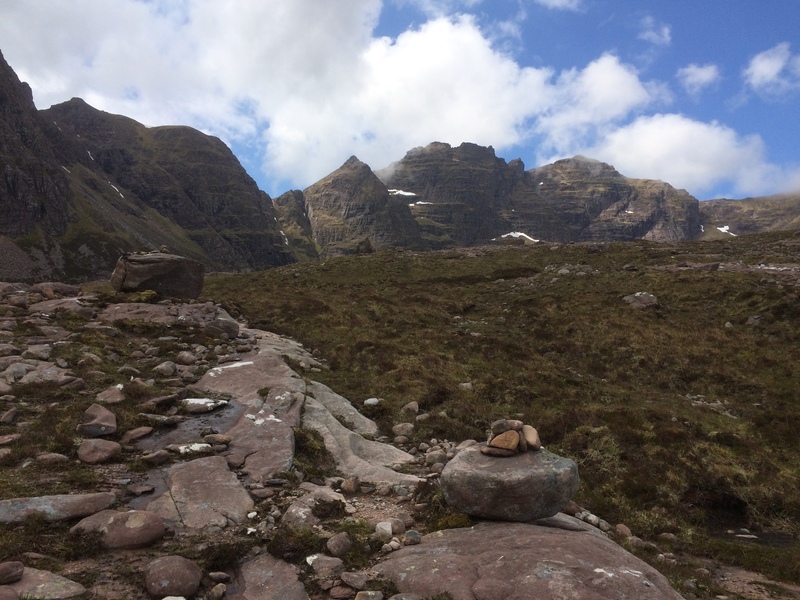 All the way up Coir’ a’ Ghuibhsachain, the cloud held its ground. My progress by the waters washing down from the as yet unseen Loch Toll an Lochain was watched closely by a herd of feral goats, strung out like an Apache raiding party along a rocky skyline. When I emerged at the lochan just after noon, there was little of this mighty mountain visible above the waterline. I sat down on the boulders of the causeway and had lunch hoping for a miracle. Half an hour passed. Nothing moved. I looked up into the grey and wondered if I should nip up on to the ridge and try to catch up with my friends, but the parts of the gullies I could see still held a significant amount of old snow and there was no guarantee of an easy passage higher up. What to do? I was loath to call it quits just yet so I left my rucksack and walked round the loch to the foot of the Corrag Bhuidhe Buttress. It was brooding and impressive, but still nothing moved. Then came that little moment of hope, the reward for perseverance. The dark, threatening shapes above on my left started to become more defined, the grey swirling higher out of their territory. The cloud line had lifted on the water and there was a growing light straining to push through. The faces in front of me were being unmasked, painfully slowly but surely. I primed the cameras and set off round to the right, a feeling that this might just work out after all. A patch of blue sky peeked through and seconds later the cloud started to rise en masse. The pinnacles of Corrag Bhuidhe thrust their way into full view. That tilted, outrageous slice of rock, Lord Berkeley’s Seat, quickly followed suit, just wispy trails of white dancing round their heads. Another minute and the whole ridge was laid out before me, not once, but twice, the reflection in the mirror waters of the loch providing a double treat. I had waited it out for nearly an hour and a half and I had got my reward with a buy one, get one free bonus. Here was Scotland’s finest mountain in all its glory. I spent 20 minutes drinking it all in before the cloud started fighting back. It swirled in and out, little sorties hinting at a bigger assault. A glance over to the Fannaichs showed what might be heading this way, pitch black skies, a low rumble of thunder and the occasional lightning flash. I decided to get going before my luck ran out. Less than an hour later the view had largely vanished, the grey reclaiming lost ground. My patience had paid off big-time. Twenty minutes was all it took to make a whole day a resounding success.